"Do I look like I'm having fun, I ask you?!?" "I distinctly recall there being less of this a few days ago." You look like a kitty on a mission Allie! You go girl! Oh no! You look like you are exploring the Arctic Circle. Allie, you are an adventurous gal! Love you pink clawrs against the snow. MY human brother's wife has to drive from St LOuis to Kansas City on Friday or Saturday. We hope it is well cleared by then. Holy carp! Your snow swelled up! Goodness - have you been sent to Siberia? Keep warm that looks very cold indeed. And look! The Sidewalk kept going this time! It looks awfully cold, but you are stunning! Stay warm; hugs & belly rubs! Sun!?!?! Oh how we wish! 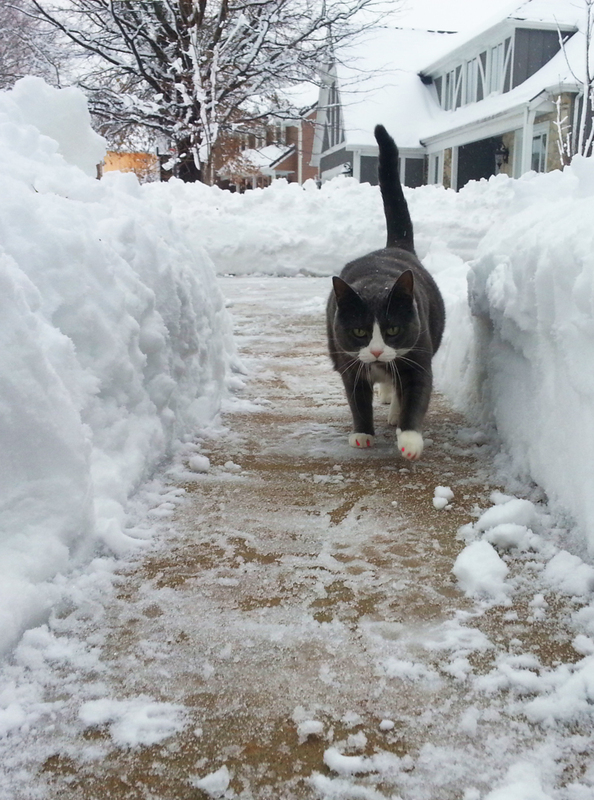 ANd yes, Mother let me out without a leash or anything because...there was NO WAY OUT of the snow! What a dirty rotten evil nasty trick. She can bring back my GRASS now. Wowzers Allie....that is one heck of a load of white stuff there. 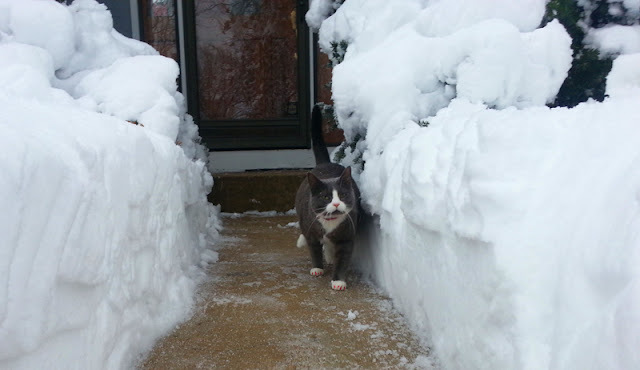 I bet you enjoyed a breath of fresh air BUT I also bet you were happy to get back inside and warm up those paws!! Allie doesn't look at all amused. MOL. Oh my cat! That's terrible! At least they shoveled you a path. Stay warm, furriends! Brrrr I'd get back in the warmth. Stay warm and stay safe. Have a wonderful Wednesday. Uh-oh...Faraday perked up at the idea of being pulled BY a sled. As long asa it's human-powered and not by a noisy monster machine! *giggle*! Quite literally! We'd LOVE to send you some, do you accept C.O.D.? Allie, this snow is not meeting with your approval and I do not blame you! Holy cod! We thought we got a lot but it's nothing compared to that. Hope you're staying warm! Oh Allie, your beautiful (but perturbed!) face says it all. We hope you get some warmer weather SOON. Hugs to you all. Holy cat! You sure did get a lot of snow! My face would look like that too if I had to go out in it. Allie, grrlfrend, you need little pink booties to wear out there. You didn't look very happy and I don't blame you. Maybe you can bottle some snow for the summer. Allie, you look so mad! We think a pair of pink boots would cheer you up! Allie: *perk* Did someone say PINK?!?! Holy canoli! Look at all that white stuff!! Wow, we had to Pin this! MOL! Utterly disgusted, she is! Holy Moly! Where do you live? Alaska? Antarctica? Our biggest snow this year has been about 1.5 inches! Surely it can't last much longer - can it? Holy cow! That's some snow! Great photos! OMC , OMC , OMC !!! SOOOO much snow you got ! We have never seen that much snow at one time here! Gulp! That is like here was a month ago!